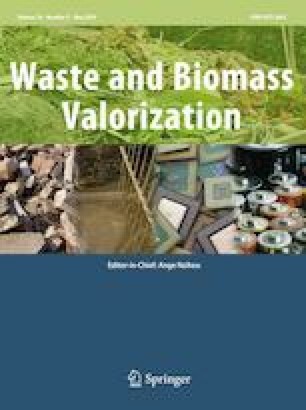 Response surface methodology (RSM) using the central composite design (CCD) approach was used in the parametric optimization of biohydrogen production from potato waste and the scale-up study was investigated using immobilized anaerobic mixed sludge. A two-level-four-factor (24)-CCD obtained via a statistical software (STATISTICA 8 release 7) was used to generate 26 fermentation experiments. The experimental results were used to generate a second-order polynomial regression equation relating the biohydrogen production to the parameters considered (potato waste concentration, pH, temperature, and fermentation time). The optimum conditions for biohydrogen production were 39.56 g/L, 7.86, 37.87 °C and 82.58 h for potato waste concentration, pH, temperature, and fermentation time, respectively with a corresponding biohydrogen yield of 68.54 mL H2/g total volatile solids (TVS). A coefficient of determination (R2) of 0.99 was obtained by solving the polynomial regression equation. The obtained optimized conditions were further validated experimentally resulting in biohydrogen yield of 79.43 mL H2/g TVS, indicating a 15.9% biohydrogen increase. Scale-up conducted at the validated optimized conditions with the immobilized bacteria generated 298.11 mL H2/g TVS with maximum fraction of 56.38%. Therefore, these results demonstrate the potential of up-scaling biohydrogen production using immobilized bacteria which could be instrumental towards its large-scale production. The funding was provided by National Research Foundation - South Africa (Grant No. 95061).